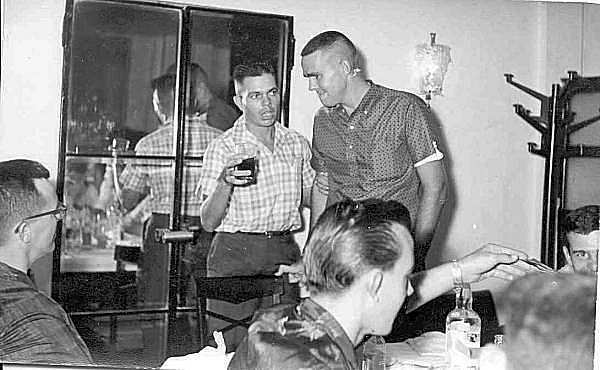 This page is devoted entirely to interesting stories provided by former members of the 33rd Trans Co. or 118th AHC. It might be safe to say that the stories are true but in some cases "the names may have been changed to protect the innocent"!! A Bandit Crew Unfound for Days! 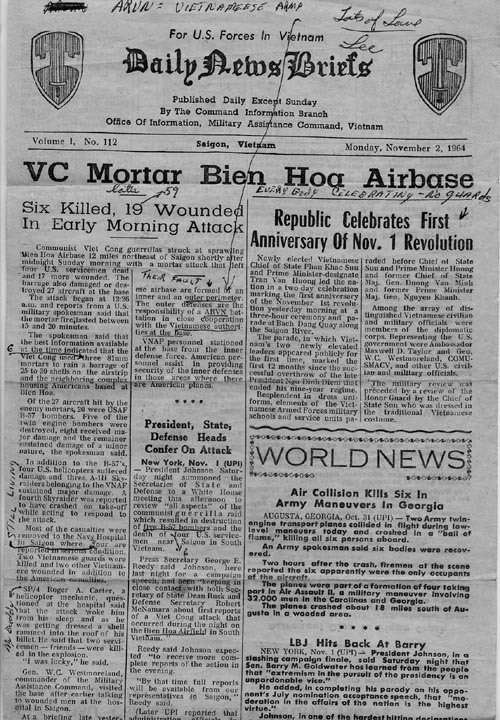 It was not Tet, yet the Viet Cong mortar attack on Bien Hoa Air base just after mid-night on 1 Nov 1964 created many large headlines back home in the United States. The Bien Hoa Air base was one of the most important bases in Vietnam, outside Tan So Nhut Air base in Saigon. The base was jammed with aircraft and troops. The troops lived mostly in single story RMK quarters clustered on the southern side of the runway. All the aircraft were clustered on the parking ramps with no revetments. Most were unprotected and vulnerable. The attack was very effective! 2 Vietnamese) and wounded 19! This publication was sent through command channels and ended up in the Orderly Room of the 118th where PFC Martin Lehotay worked as Company Clerk. The attack began at 12:26 a.m.
and lasted for 15 to 20 minutes from an estimated 3-81MM mortars. 27 aircraft were hit(20-B57s; 4-helicopters(not Army); and, 3-A1Hs). A fourth A1H crashed attempting to take-off. 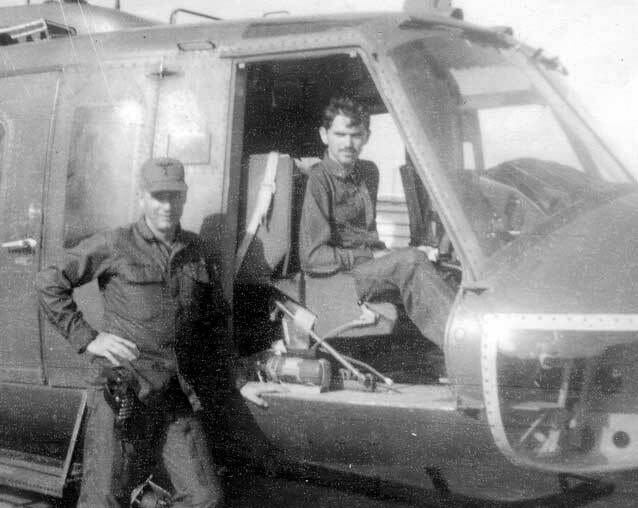 SP4 Roger A Carter, a helicopter mechanic, questioned at the Navy Hospital in Saigon, said that the attack awoke him from sleep and as he was getting dressed, a shell rammed into the roof of his billet. He said that two servicemen, friends, were killed in the explosion. "I was lucky," he said. The following photos were provided by Dave Cobb, son of TSGT Gregson L. Cobb, who found the photos in his fathers things following his death in 2016 and sent them in hopes they might be included in this story of the 1 Nov 1964 mortar/rocket attack shortly after mid-night on a sleepy Sunday morning on the Bien Hoa Air Base in Bien Hoa, Vietnam. 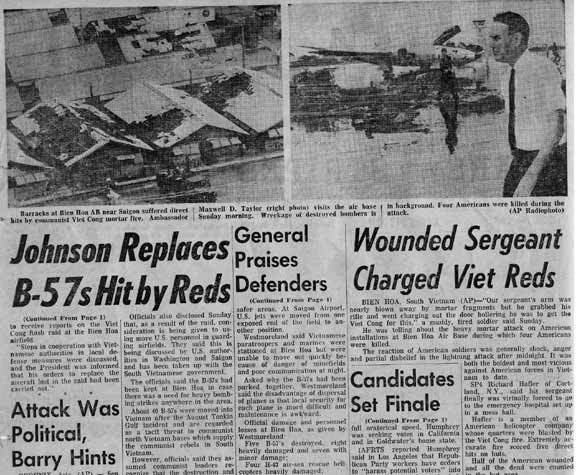 The attack was considered a very important event and drew much attention to the war effort in Vietnam as seen from the newpaper articles included with this story. 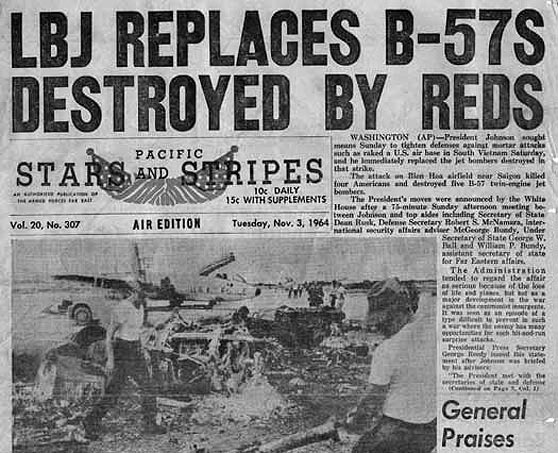 Two days later the "Stars and Stripes" carried the attack with very large headlines. "The Administration tended to regard the affair as serious because of the loss of life and planes, but not as a major development in the war against the communist insurgents." On page 2 of the 3 Nov 64 edition of "Stars and Stripes", Westmoreland praised the Vietnamese defenders. He also gave official damage at 5-B-57s destroyed, 8 heavily damaged and 7 with minor damage; 4-H-43 air-sea rescue helicopters heavily damaged; 4-A-1H's totally lost; 7 buildings destroyed and 11 damaged; 4-U.S. Army EM killed, 17-U.S. Army men and 2-USAF men were wounded and hospitalized. The mortar rounds used in the attack were U.S. made and made in 1944!! Note: aerial photo of 118th buildings. I seem to remember that Lt Jim Viele was duty officer that night. Also, it seems to me that WO Ernie Eubanks pulled the VNAF pilot out of the burning A-1, which had crashed while attempting takeoff. There was a story going around that one of our pilots, a WO Christensen attempted to shoot the lock off the arms room with his .357 and shot all around the lock while exclaiming that, " it always worked in the movies." That may be lore that took on it's own life, but made a good story anyway. I do know that the men all had to lock up there weapons at night unless they were on duty. The mortar attack on Bien Hoa Air base was very successful. The VC had inflicted great damage and caused significant loss of life. More importantly for the VC, it stirred up the U.S. press and media and gained considerable coverage which highlighting their success! The Johnson Administration wasted no time in cranking up the rhetoric which soon resulted in the deployment of combat troops to Vietnam. The VC attack was timed to take advantage of the large number of massed aircraft of both the U.S. and Vietnamese Airforce. Likewise, the concentrations of troops and personnel was very vulnerable. These two factors increased the likelihood that direct hits would be devastating. The enemy's intelligence was quite good and apparently very current. The Bien Hoa Air base continued to be an inviting target for VC mortars and rockets for the next 7+ years! where one of the 81MM mortars exploded, killing one of the 4 fatalities. 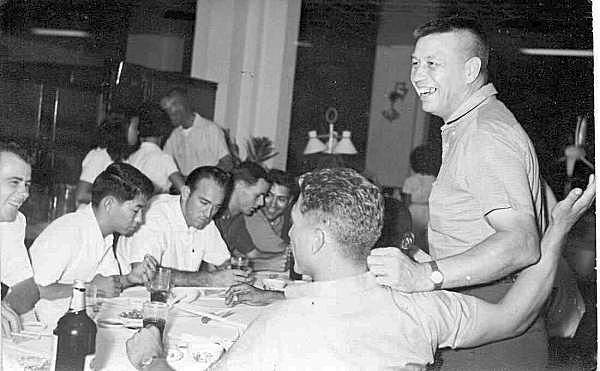 L to R: SFC Vasquez(? ), SFC Hackney, SFC William Haney , SFC Willis(?). Official U.S. Army Photo taken 14 Nov 64. 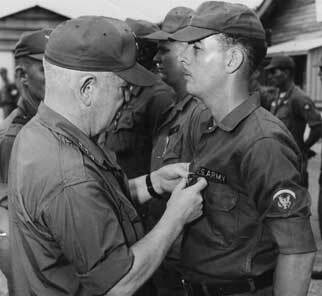 SP4 James D. Larson of the 118th awarded Purple Heart by 145th CAB Commander LTC Robert K. Cunningham. Official U.S. Army Photo taken 3 Nov 64 at Navy Hospital in Saigon. Within in a few months the 118th enlisted personnel moved from the old RMK barracks to a new area farther from the flight line and to the East of the "Bird Cage". The USAF and VNAF learned to disperse their aircraft and to build revetments to park them in for protection. The pilots of the 118th moved to Cong Ly street within the city of Bien Hoa. Never again were the mortar and rocket attacks successful in doing as much wholesale damage to the 118th Aviation Company and its personnel again or the VNAF or USAF on Bien Hoa Air base. The 118th Bandits and all other helicopter units gunships located at Bien Hoa began twice per day aerial recons to search for suspicious people or emplacements for rocket and mortar attacks. The twice daily low level recons by the gunships were always accompanied by a U.S. and Vietnamese observer from III Corps HQ. They often extended outward for up to 5 miles around the Bien Hoa Air base even across the Song Dong Nai River into War Zone D. The recons were apparently successful in limiting future attacks by mortars, because future attacks were primarily rockets that could be fired at a greater range and a lower angle of elevation. 118th Company Clerk on 14 Nov 64. If you were in the 118th during this attack and have remembrances you would like to contribute, contact the Webmaster. The Arc-en-Ciel ("Rainbow" in English) was a very nice restaurant/hotel in the Cholon District of Saigon. Cholon was the section of Saigon where predominately citizens of Chinese descent lived(ie "China Town"). The restaurant was made famous during the French period in Indo China, following WWII. The restaurant is still located at 55 Than Da Street in Saigon. The happy occasion in the photos below is not fully known. Some have said it might have been a Farewell Party for the Crew members of the CH-21's, many of who stayed extra time to turn them in. Or, some have thought it might have been a party to celebrate the completion of Lycoming and Bell Helicopter training courses on the new UH-1B's that replaced the CH-21's. The date would have to have been sometime in early 1964. If you know the details and can shed light on the place and purpose of the celebration, please contact the Webmaster. Left side of table(L to R): SP4 Larry Coffman, SP4 Koshi, LT Bob Thornton, LT Gary Fischer, LT Sal Comito. LT John Nasche, SP4 "Red" Sparling, LT Bill Willson & CPT Jack McKnight. Left corner: LT Frank Zipperer(looking down)& LT Tom Moody. 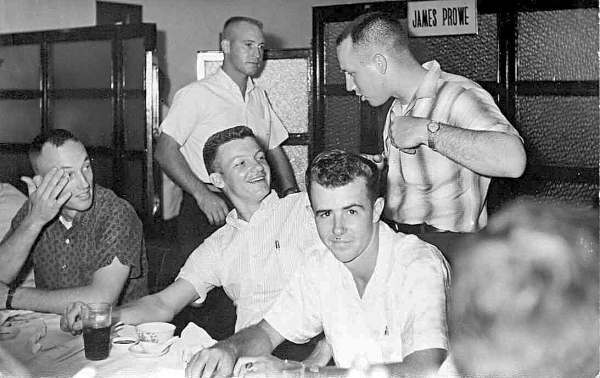 L to R: SP4 Dunn, SP4 Jack Miller, LT Frank Zipperer(smiling). In corner: SP4 "Red" Sparling. Not everyone needed an "Official" driver's license as issued by the local Vietnamese authorities. The Cong Ly Street Villa within the town of Bien Hoa was where the 118th pilots lived from about early 1965 until after Tet of 1968. The bar or lounge within the Villa was known as the "Thunderbird Lounge". While this was not the original "Thunderbird Lounge" that is written about by MG Bob Brandt, AUS Ret. in his book by the same name, it was a direct descendent of that original lounge. The lounge was run by the unlucky pilot who was made the Club Officer. He had to hire the help, buy the booze and see that the lounge was operated properly with no losses. Below are some drink chits used in the Lounge. They are provided be former Thunderbirds which they saved as a remembrance of that place we called "home," the Thunderbird Lounge. Thunderbird Lounge drink coupon booklet #83 and some 25 cents coupons. Note date of "9 Feb 66." 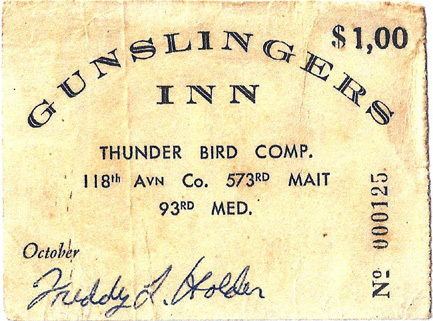 Thunderbird Lounge drink coupon booklet #16 in later 1966. Front cover of drink coupon booklet #199 belonging to Jack Swickard in early 1967. Slot-machines were present in the Thunderbird Club almost from the very beginning as far as anyone found can remember. The problem was, what could be used to work the slot-machines which usually worked on dimes or quarters. Remember, all official money was in MPC and all paper! Ah Ha! 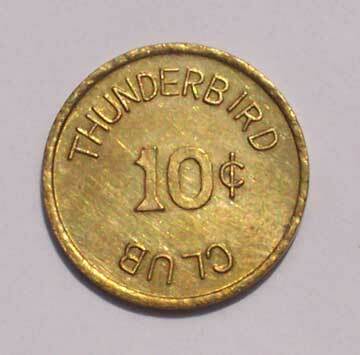 Why not have Thunderbird Club slug coins or tokens and everyone would be happy. That is what was done and below is one of them provided by Pat McLarney who served with the Thunderbirds in 64-65. The front and back of each coin/token was identical. 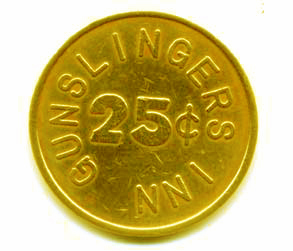 Pat McLarney did considerable research to try and find out just where these Thunderbird Club tokens for the slot-machines came from. 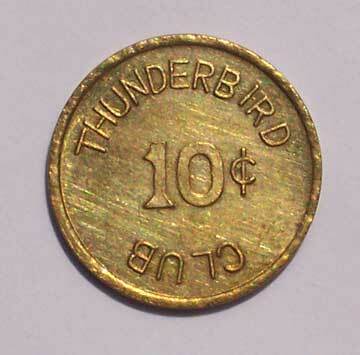 He thought it possible they might have come from the Las Vegas Thunderbird Casino from which the unit got its name. So far, no absolute proof has been found to prove or disprove that theory. If anyone has information that might shed light on the Thunderbird Lounge and its history, contact the Webmaster. 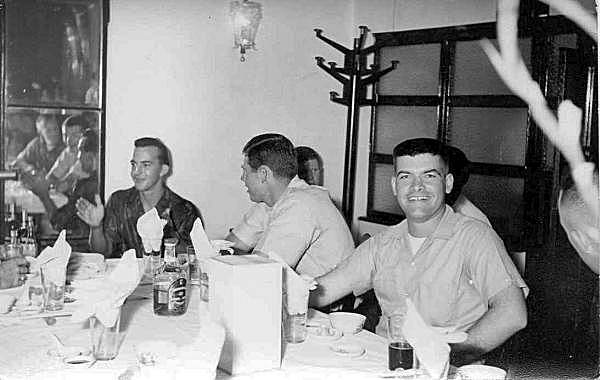 Again, not much is known about the EM Club, called the Gunslingers Inn which was at the Bien Hoa Airbase compound. Above is a front and back scan of a coin presented to the webmaster recently by Lawrence Crawford from Tulsa, OK. Lawrence was in the ASA in the 69-70 time period out of Cu Chi and travelled around the III Corp Tactical Zone working for the ASA. He says he doesn't know exactly where he got it or when, but has had the coin all these years. He said he only found it recently. Then he tried Googling for the 118th Avn Co and found our web site. Thanks Lawrence Crawford for the wonderful gift. 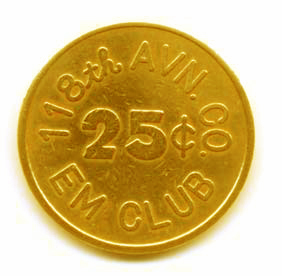 If anyone can shed light on the Gunslinger Inn/ EM Club as to when it was started and anything else which might provide some history, please contact the Webmaster. Much has been written concerning efforts to keep up the "morale of the troops" in time of war. Many wild and crazy stories have alluded to wholesale booze, brothels and even the importation of "round-eyed" Donut Dollies who put on shows, dramas and tea parties for the troops. While the Donut Dollies were on the up-and-up and much appreciated other places could be considered questionable. One such place in Bien Hoa was called The American Club. The American Club was not an official club run by the U.S. Government. 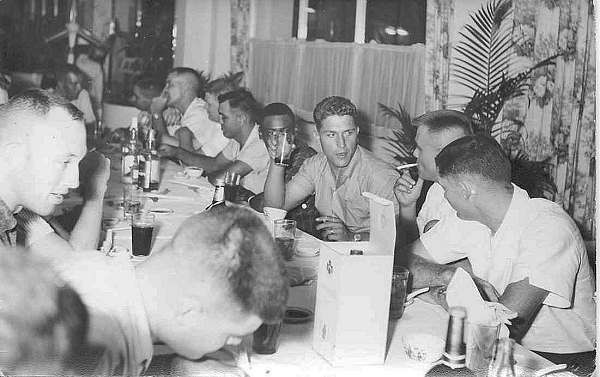 It was a privately owned and operated club for all U.S. military personnel, regardless of rank. The American Club was located at the exit end(West end) of the one-way Cong Ly street in the town of Bien Hoa. The Club had many kinds of activities as can be seen from the flyer below. Most unusual was the roof top bar where on a cool night a cool #33 beer was not bad. Some reported watching mortar attacks with a beer in hand from the roof of The American Club. How bizarre! Calling all the specialties "unusual " creates somewhat of a mystery, since they all could add up to having a "good time." Flyer prepared by the proprietors of The American Club. To be on the safe side, the medical personnel of the 145th CAB, plus the medical personnel of its various subordinate units(118th, 197th, 71st and 68th), carried out a fairly regular and rigorous program of "preventive medicine" where the girls were concerned. taking their turn at "preventive medicine" on girls at The American Club. for other Lounges and Open Mess Halls around III Corps. Mess Hall and Lounge Cards from around III Corps(65). To borrow and word, October 9, 1969 was a day that will live in "infamy" in the history of the 118th Thunderbirds. October 9, 1969 was a terrible day because of the loss of 6 Thunderbird lives and 5 men from the 199th Light Infantry Brigade. 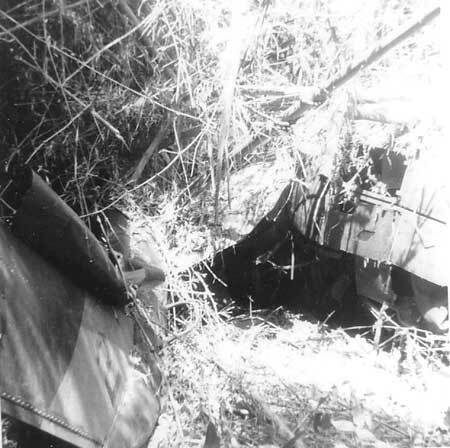 On October 9, 1969, a UH1D (63-08826) helicopter crew and 5 passengers were in the last aircraft of a flight of Thunderbird aircraft executing an extraction from a mined PZ (pick-up zone) in eastern Long Khanh Province, South Vietnam,. The PZ was very near the shores of the swiftly flowing Song Dong Nai River. During the extraction, the heavily loaded helicopter's main rotor blades clipped some 45 feet tall bamboo while struggling out of the PZ as formation trail. The helicopter, already struggling with low rotor RPM began losing altitude. It turned right and headed west over the river in an attempt to regain air speed. Shortly thereafter, the aircraft commander, CW 4 James A. Bailey was forced to make a textbook water landing in 15-20 feet of water. The UH-1D sank on its left side in less than 10 seconds according to reports. Continuous air and water searches were conducted immediately after the crash. They resulted in the rescue of two crew members, WO1 Steven. T. Kilbourne and SP4 O. Cowherd. None of the 5 passengers could be rescued and all perished! For days after that, loudspeaker broadcasts, and leaflet distributions to the locals were conducted. These took place during the periods of 9-15 October and 19-21 October, 1969. They were finally suspended October 16-18, 1969 only because of poor weather conditions. Recovery of most of the missing personnel aboard was accomplished. However, 5 were never recovered and classed as BNR. A LRRP swimmer trying to search the site had difficulty working in the swift waters of the Song Dong Nai river, even with a rope. The individual reported that equipment was seen on the shore after the crash and it appeared to be alternately submerged and then to reappear. It could not be determined immediately how many persons escaped the aircraft. One who did escape reported that he could not make it to shore and went under numerous times. Another survivor reported seeing a man go down within 3-4 feet of him, but never saw him again. One of the individuals who was initially thought to have survived, later drowned or was lost in the incident. The only survivors of the crash of UH-1D (63-08826) was WO1 Steven T. Kilbourne, the young pilot and the Crew Chief SP4 O. Cowherd. The two crew member remains located were identified as the crew chief, who had survived the immediate crash, but later drowned, and CW4 James W. Bailey, the aircraft commander, who was lost and remains recovered. However, the gunner SP5 James Henry Turner, was presumed drowned and he eventually classified as BNR. The waters of the Song Dong Nai River were swift and treacherous that day apparently due to monsoon rains. It is particularly tragic that men who survived an aircraft crash would then drown trying to reach safety or aid others who were passengers. SGT James Lawrence Suydam, SGT Dallas Alan Driver, SGT Jimmy Ray Garbett, SGT Raymond Gregory Moore and SP5 James Henry Turner were listed as Killed, Body Not Recovered (BNR). The fact that so many 199th Light Infantry Bde. Sergeants died in the last aircraft out of the PZ should not go unnoticed. Typically when a unit on the ground was extracted from a PZ, the unit places many Claymore mines around the PZ and then detonates them as the last men load on the aircraft to leave. These Sergeants did just that and were the last to leave the PZ and the ones to detonate the Claymore mines. True leaders and men doing the job of heros. at the age of 42, died tragically with 6 others when his aircraft crashed and sank into the Song Dong Nai River. 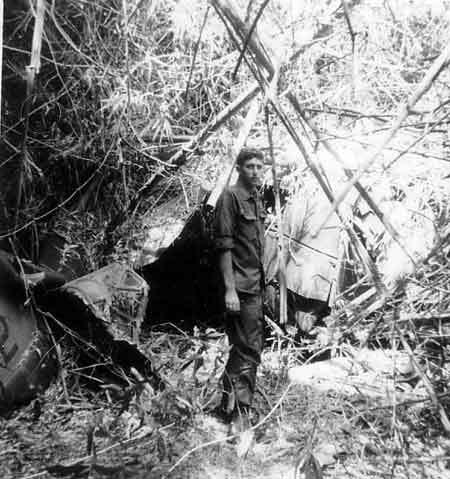 While supporting troops in heavy combat at coordinates YT 3025, about 7 miles East of Bien Hoa on October 9, 1969, Bandit 2, a UH-1C (66-00530) gun ship, was lost for days when it crashed in tall bamboo in bad weather. Bandit 2 with the bodies of the 4 killed crew members on board, was not found for many days afterward. Apparently, some Vietnamese wood cutters found the aircraft in thick bamboo, completely covered (See photos below). According to the accident summary, Bandit 2, piloted by Aircraft Commander CW2 Owen Tetsumi Hirano, and Pilot 1LT Robert Scott Mason, Jr. and Crew Chief SP5 Greg Bradford Scott and Gunner SP4 Danny Ray Spencer, was flying wing with 1LT John W. Mack who was the fire-team leader of the light fire-team. CW2 Hirano's aircraft had a 20 minute fuel warning light on. It was dark and both aircraft experienced lost contact with the ground and began flying on instruments in very poor weather. They were within 500-600 feet above the jungle tops. They both new this was in the vacinity of the high tension power lines that followed Highway 1. CW2 Hirano called Lt. Mack and told him he had Highway 1 in sight with his search light and would pick it up and follow it back to Bien Hoa. 1LT Mack followed CW2 Hirano and shortly after passing over Trang Bom they ran into extremely heavy rain and went completely IFR. CW2 Hirano called and said he was making a 180 degree turn to the right. They both turned right and LT Clay A. Hinderliter, co-pilot with LT Mack, lost sight of CW2 Hirano's aircraft. LT Mack's aircraft made it back to Trang Bom and landed. They tried repeatedly to contact CW2 Hirano's aircraft by FM, UHF and VHF radios, but no contact. After about 20 minutes on the ground at Trang Bom, the weather cleared sufficiently to take-off. LT Mack and LT Hinderliter took off and proceeded the short distance to Bien Hoa, but CW2 Hirano was not there. A search was conducted for many days, without success. However, following an intelligence report that some Vietnamese woodcutters had found an aircraft crashed in thick bamboo, the aircraft was finally found.